We’d love your help. Let us know what’s wrong with this preview of The Laptop Millionaire by Mark Anastasi. The Laptop Millionaire provides 32 easy to follow step-by-step strategies proven to make real money online. You’ll learn how you can replace your income in 90 days or less, and forget about having a job – instead, create your own economy! The Laptop Millionaire reveals the exact strategies author Mark Anastasi used to make millions of dollars online and includes the success The Laptop Millionaire provides 32 easy to follow step-by-step strategies proven to make real money online. You’ll learn how you can replace your income in 90 days or less, and forget about having a job – instead, create your own economy! 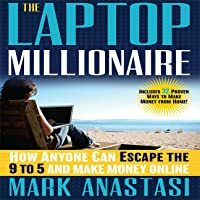 The Laptop Millionaire reveals the exact strategies author Mark Anastasi used to make millions of dollars online and includes the success stories of over 100 of Mark’s students from around the world. Whether you need an extra hundred dollars a week or you want to start an Internet empire, this book gives you the tools and advice you need. His no-fluff, no-filler strategies provide a blueprint to online success allowing you to discover the laptop entrepreneur lifestyle for yourself. • How to turn $400 into a $10,000 a month business thanks to ‘ebooks’! • How to make $6,000 to $20,000 in 90 minutes thanks to ‘Joint Venture Webinars’! To ask other readers questions about The Laptop Millionaire, please sign up. i read this book filled with many real world examples and ideas can any one suggest me another book of similar kind which have new ideas regarding making money online? A friend kindly sent me a copy of The Laptop Millionaire, and while I was sceptical of the content based on the sub-title of "Anyone can escape the 9 to 5 and make money online", the book contained chapters on interesting topics such as how to make money from affiliate programmes, social media, webinars, members websites, online marketing and much more. The author Mark Anastasi, shares his own story of rags to riches while mentored by a mysterious "Laptop Millionaire" -- a man he meets who seemin A friend kindly sent me a copy of The Laptop Millionaire, and while I was sceptical of the content based on the sub-title of "Anyone can escape the 9 to 5 and make money online", the book contained chapters on interesting topics such as how to make money from affiliate programmes, social media, webinars, members websites, online marketing and much more. The author Mark Anastasi, shares his own story of rags to riches while mentored by a mysterious "Laptop Millionaire" -- a man he meets who seemingly makes millions with ease and lives a comfortable life living in exotic locations. The life most of us dream of. Is the Laptop Millionaire a real person? Is the book a parable, which we are meant to learn from but not take literally? It's here I became confused (and dare I say, suspicious) as the book moves between conversations with the author and the "is he real/is he a character" Laptop Millionaire, as well as sharing real-life testimonials from normal people who have gone on to make hundreds, thousands and millions of dollars from the techniques shared within the book. It all comes across as rather sales-ey and a bit hard to believe I'm afraid. The techniques the author shares are, on the whole, very sound and if implemented consistently may lead to great results. The cynic in me certainly thinks that they aren't quite as easy to implement as the author suggests though -- although without trying them myself, I can't say one way or another. I was deeply uncomfortable with some of the other techniques shared in the book, such as "buying followers" for Twitter and Facebook. Some of the other techniques bordered on spam, and while it's not difficult to attract hundreds or tens of thousands of followers by using these methods, I find it hard to believe the followers you've "bought" would be valuable or turn into paying customers. Yet the book does contain some nuggests and certainly gives pause for thought. The chapter on outsourcing is one of the most useful. Overall though the book does feel like a more simplistic and slightly lower-rent version of "The Four Hour Work Week" by Tim Ferris. Some of the talk left a bit of a bad taste in my mouth (very used-car-salesman), but I understand the "create value for others" exhortation and think that the core of the message is to use every tool at your disposal. I won't be doing what this book says (I'm afraid I just can't get my skin to thicken up at the moment), but at the same time, this was an eye-opener, if nothing else. An unexpected takeaway I got from this book: it explains why I am currently getting so many webinar sign-up e-mails Some of the talk left a bit of a bad taste in my mouth (very used-car-salesman), but I understand the "create value for others" exhortation and think that the core of the message is to use every tool at your disposal. I won't be doing what this book says (I'm afraid I just can't get my skin to thicken up at the moment), but at the same time, this was an eye-opener, if nothing else. An unexpected takeaway I got from this book: it explains why I am currently getting so many webinar sign-up e-mails that I am getting truly sick and tired of them. I may have been interested in the topics in the beginning (I'm a tax accountant and I'm on some mailing lists), but too many of these webinars have been of the shallow, scratch-the-surface type, and the delivery seemed much more along the lines of trying to generate as much content as possible than to convey actual useful knowledge/know-how. The constant sell-sell-sell pressure I am getting is enough to make me look for an unsubscribe button for every mailing list that sends me a webinar that either doesn't seem connected to my interests, or worse, is a complete waste of 30 minutes to an hour of my time that I could have used for actual productivity and not rehashed information I can get from a Google search. Only two of the webinars I've been invited to were even remotely any good; the rest of them were disappointingly unhelpful, and in one case the webinar was only barely connected to the promised topic. This is a good book. I was not the exact right target for it, but there's a lot to learn from THE LAPTOP MILLIONAIRE. I loved what he said about starting an online business without any money, the eBook business, email marketing and webinars. I've learned a lot on these subjects. But since I'm a social media professional myself, I thought Mark Anastasi's advice on how to monetize Facebook and Twitter were a little narrow-minded and not adapted to the reality of existing brands. Matter of fact, yo This is a good book. I was not the exact right target for it, but there's a lot to learn from THE LAPTOP MILLIONAIRE. I loved what he said about starting an online business without any money, the eBook business, email marketing and webinars. I've learned a lot on these subjects. But since I'm a social media professional myself, I thought Mark Anastasi's advice on how to monetize Facebook and Twitter were a little narrow-minded and not adapted to the reality of existing brands. Matter of fact, you can actually hurt your brand if you apply his social media advice. A worthwhile read that gave me a number of ideas on how to market and sell online. I'll certainly be using some of the strategies from this book in the future. However, there were two big negatives for me. Hardly a page goes by without ClickBank being mentioned. It might be a fantastic resource for affiliate marketers, but the book really oversold it. Secondly, the book goes against my personal philosophy of creating value. Perhaps it's the reason that I'm not rich (yet), but this book is about A worthwhile read that gave me a number of ideas on how to market and sell online. I'll certainly be using some of the strategies from this book in the future. Secondly, the book goes against my personal philosophy of creating value. Perhaps it's the reason that I'm not rich (yet), but this book is about making cash - end of - by selling anything to anyone who will buy it. That doesn't sit well with me. I liked this. it gave a person so many ideas to use to start their own business. you don't have to follow his formula. But the amount of resources open to everyone is AMAZING! This book is one of those books that contains basic information that you can find for free online by doing some research. That wouldn’t be funny, if one of the idea to make money in this book suggest just that, that you go online and collect free information, get them into book and sell to people. This is just one of those MLM schemes books, author make money by promoting money making opportunities. Going from zero to fortune by selling (mostly) junk products. There are so many things that are misleading in this book, especially the case studies presented and unsustainable business models. The majority of sites presented in this book are no longer available. Because their business models was to take advantage of people for their money. I checked the ones that are still available, and some of them are very slow and ugly designed sites; I can’t image that you make so much money but can’t afford decent hosting and design on site. Idea presented about E-books creating by scraping free sources and selling that book at high price is straight up scam. It’s unethical way of doing business, and that’s why real experts have hard time selling books that are written with very informative content in them. Also, creating thousands of sites with crappy content just to spam Google and get portion of traffic sound ridiculous from my point of view. And Google has cracked many of these sites and put them out of business – thank you Google! There are many other things in this book that are pure nonsense, just the way to lure you into thinking that it’s easy to create serious business online. So many people these days just wan’t to take that MLM way and promote money making opportunities, from which they profit. Presenting themselves as some kind of experts on business. This niche is gone so far, that people now rent cars, planes, villas to present themselves like gurus and selling them courses on how to become successful – but everyone of them just take free information available online, other information from cheap books that are available, and create courses that they sell for hundreds or even thousands of dollars. Some good ideas about business and internet marketing, a lot of fluff or useless (to me) material, and one or two ethically questionable suggestions. I'll take what seems interesting and move on. If you want to cut to the chase, read this book! Massive amount of information. It all seems legit, but I always wonder what portion of the "information marketing" out there is about information marketing itself. If you've spent much time online, I'm certain you've seen this type of material. Mark Anastasi has written the skeleton of how to make money online and gives some of the details--but often not enough detail for a reader with no background to successfully imitate his results. This book is loaded with his personal websites to additional webinars and recorded events. I watched a number of them and they gave good information to get people started yet often you have to purchase some additional coachin If you've spent much time online, I'm certain you've seen this type of material. Mark Anastasi has written the skeleton of how to make money online and gives some of the details--but often not enough detail for a reader with no background to successfully imitate his results. This book is loaded with his personal websites to additional webinars and recorded events. I watched a number of them and they gave good information to get people started yet often you have to purchase some additional coaching or additional program to get the full picture. The book is loaded with "case studies" which recount success stories. Unfortunately these case studies also lack the application detail for the reader to model it in their own life. The title is misleading but who would really read, "make more money through the internet." This is a resource heavy book that reads more like a reference book than a get rich quick scheme. The author gives several types of examples of how to either start new businesses or improve your own business through internet marketing. It may be a little dated as internet marketing moves at a lightening pace but what if just one of his suggestions made your business more profitable? Could it mean getting o The title is misleading but who would really read, "make more money through the internet." This is a resource heavy book that reads more like a reference book than a get rich quick scheme. The author gives several types of examples of how to either start new businesses or improve your own business through internet marketing. It may be a little dated as internet marketing moves at a lightening pace but what if just one of his suggestions made your business more profitable? Could it mean getting out of debt, saving for retirement, paying off the mortgage, etc? The Laptop Millionaire could have been a 2 or a 4 out of 5, so I settled on a 3. The information, though dated in places, was generally helpful but the scammy vibe (there are a lot of exclamation points ... a lot) kept this from being a next-level book like 4-Hour Workweek. The anonymous-millionaire-who-gives-advice angle was also done to death in the Rich Dad, Poor Dad series. Don't need another. Even if you don't plan on sitting on a beach and running your business from a laptop, I would recommend to anyone in business that they read this book. This book gives insight into updating your online profile in simple and easy language to understand. As in many industries, people speak in shorthand. My eyes would often glaze over when my website (and other advertisers) would talk in their shorthand. This book breaksdown the shorthand. There are a lot of good ideas in the Laptop Millionaire. I agree some of these ideas seem old and dated, especially marketing clickbank products… The book itself points the reader in few different directions as far as where to get information on-line. I have found some of the on-line resources to be useful. After you sit back and process the information found within this book you might walk away with a few useful nuggets of wisdom. Step by step instructions on how to take control and create a side business. Heavy promotion of being an affiliate. I recommend doing your research on the affiliate you choose before trying this. I have read lots of negative feedback on clickbank and (forgot the other - begins with an L) his most recommended affiliates. Also check the BBB before using. Outside of that the information was very good and motivating. I enjoyed reading this, even if it sometimes felt like a sales pitch and even though the pros and cons of each idea weren't evenly presented. Some of them seem spammy, some unrealistic, and others are just made to seem easier than they actually are. Tons of great ideas. Really covers things well too. Parts of it seem out of date and some parts seem to go over information you might have heard elsewhere - especially if you know a little about Facebook and Twitter. But I love the Joint Venture Webinar idea as well as many others. Totally worth the read. Interesting and many great ideas on how to build an internet business. While many of the ideas are practical and work, others are exaggerated somewhat and are not likely to be realistic for the vast majority of readers. That said, I have used some of the ideas and they have worked. I will surely try more. Somewhat interesting, but not very useful information that can be implemented. The best advice in the book is "sell a product," which is true because you can sell many more products than if you do something that involves selling your time. Other than that, I didn't find the advice or examples to be useful, and he does a lot of self promotion. A very captivating title and a good introduction of how money can be made online. No shortcuts, it all comes down to your effort. I found only a couple of chapters useful, and was adequate to get started. This book will give you a general idea, but not the fine details. Lots of money making ideas here that are sort of bordering on scammy. Hosting overpriced seminars to people you spammed on twitter? No thanks. But if your back is against the wall and you need cash, I suppose this book would be one place to turn. There was some good information here but the book was very repetitive. The author would tell a story about a person and then later we would hear from the person again with basically the same information. First book I have read in this genre that actually gives you good step-by-step info for many different avenues. You will walk away with some great ideas, and will be pointed in the right direction to pursue them after reading this book! There's a great number of tips an techniques outlines in this book that can help you make a descent living online. Many of them require startup investment (some very little) but I'm sure is well worth it. Currently implementing some of the concepts into my own business. This book reads like an infomercial, but it's chock full of great information. 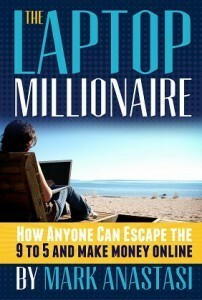 The author leads the reader to access his website frequently in the book (http://laptopmillionaire.tv/). Interesting concepts presented. It's an excellent book with many of resources on start up business online. It gave a lot of great insights on how to interact with customers and how to successful build a business to meet customers' needs. Highly recommended for people who are looking for a way to make a passive income.